What Super(Moon) Readers I Have! I ask simply Anyone take photos of the SuperMoon and bingo, ten minutes later in my inbox, photos, by Sound Beacher, who can not tell a lie and admits these photos are actually by Spouse of Sound Beacher. Works for me. You do know that Neil deGrasse Tyson is claiming it’s not all that super. It’s only 1% brighter than last month’s full moon. We went to the beach on Saturday night to see the Moon rise with camera, tripod, etc. We saw others with better equipment than us. Alas it was not to be. While it was a day early it was the only time that worked for my busy schedule. There was no moon rise at all, it didn’t look cloudy but it was blocked by wispy weather. To our back was a magnificent red glowing sunset. But too fast to relocate for that pic. 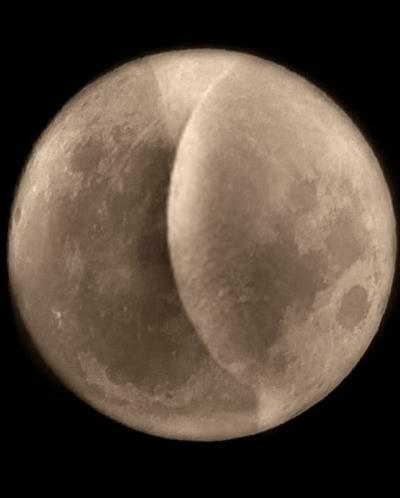 Would Neil de whatever, whatever think this is a super moon? Yeh, that’s my feeling on Neil deAss too. He’s one arrogant man. ← Texting is 25 Years Old. OMG. LOL.